No matter what your instrument this will be an up-tempo weekend of rollicking music! 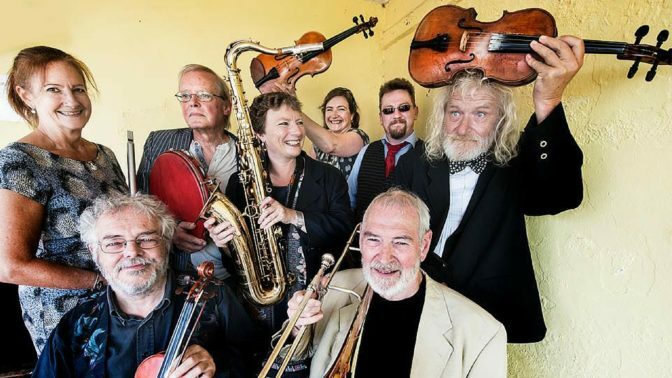 The 8-piece Old Swan Band bring with them many years’ experience as tutors and players, plus a boundless love for what they do – they can’t help communicating the fun and pleasure of their music to all who take part! There will be hands-on workshops throughout and time to play in sessions too. The weekend includes a close look at repertoire and its connections; Whilst the band were renowned in their early days for focussing on English music specifically other cultures have crept in and so the band will demonstrate and include you in workshops showing how the repertoire you source is more about how it is played than where it is from. Other workshops will explore musical arrangement in a multi instrumental line-up and creating the ultimate symbiosis between musician, dancer and caller. Musicians of all ages and abilities (and instrument!) are welcomed on this course, but under 16s must be accompanied by an adult. The Old Swan Band shot to prominence in the mid 1970s at the forefront of the English country music revival. Led by 3 driving fiddlers, all with completely different styles of playing (a workshop in itself! ), the music is given added lift by the percussion, drums and mouth organ of Martin Brinsford and piano playing of Heather Horsley. The icing on the cake comes with whistles and a 3 piece brass section of bass sax, trombone, tenor sax. Cited as one of the major reasons why English music kicked back into existence this is a rare opportunity to have all 8 of them in one place. A whole weekend in their company, in the intimate and beautiful setting of Halsway Manor promises to be a very, very special event indeed. The Old Swan Band are Jo Freya (Blowzabella, Token Women), John Adams (English String Band, Our Northern Branch), Heather Horsley (Token Women, Stocai), Martin Brinsford (Brass Monkey), Paul Burgess (John Kirkpatrick Band, Mellstock Band), Flos Headford (Melstock Band, Monty’s Maggot, English String Band), Fi Fraser (Token Women, Polka Works, the Old Fashioned), and Neil Gledhill (Threlfall’s Difference).